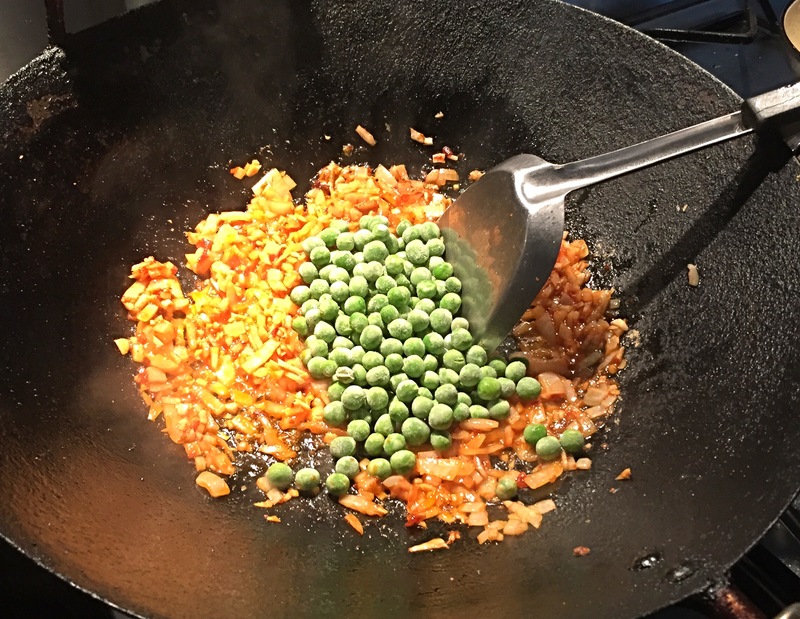 One of Greedy Girl’s all-time favourite dishes is nasi goreng – a fried rice dish claimed by both Indonesia and Malaysia. Any trip to Singapore isn’t complete without the extraordinarily yummy nasi goreng, usually for breakfast with a delectable runny fried egg on top. It’s also a staple at the excellent Malaysian Chinese restaurant in Melbourne’s northern suburbs, Jack’s Satay Bar but there, it’s done with a twist, made with duck and whimsically named ‘Ducksi’ goreng. Given we’ve been regulars at the restaurant ever since we started dating, ahem, nearly 20 years ago, we’ve often wondered how it’s made. The recipe we’ve shared here is our homage to the dish. 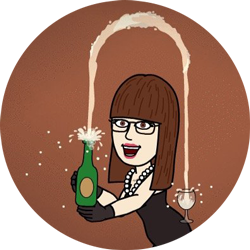 Greedy Girl continues to agitate for the restaurant to share its original recipe. 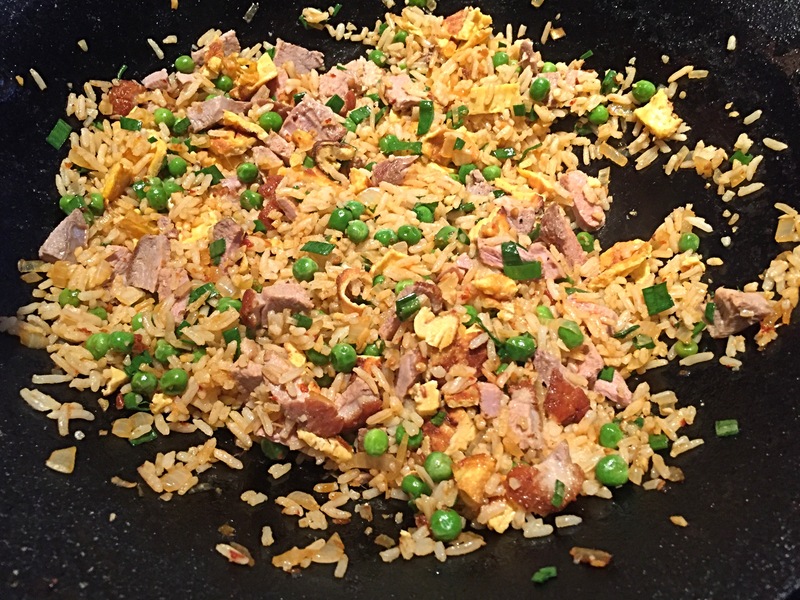 Essentially it’s our standard nasi goreng recipe but instead of our usual combination of pork, prawns and chicken, it features a luscious duck breast. 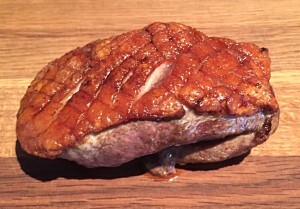 The key is to render the fat from the duck and make the skin as crispy as possible. And, of course, it’s a great way of using up leftover cooked rice. The rice we used here had been cooked two days previously and just stored, covered, in the fridge. Score the skin of the duck breast in a criss-cross pattern. Try not to cut into the flesh but it’s not a disaster if you do. This helps the fat to render. 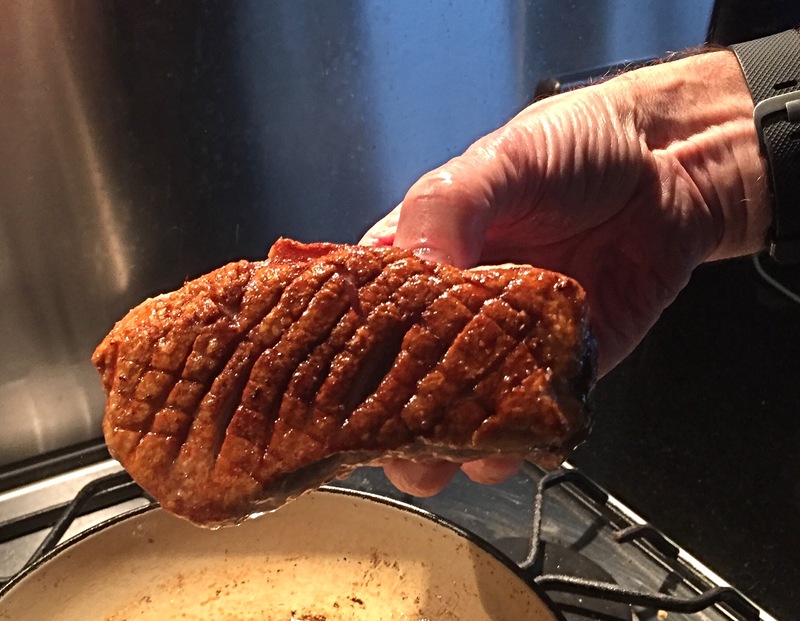 Our duck breast was frozen so we thawed and stored, uncovered in the fridge, for a day. 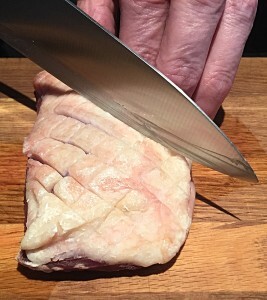 This dries the skin out and makes it easier to score as well as helping it crisp up. During this process, make an omelette in your wok. 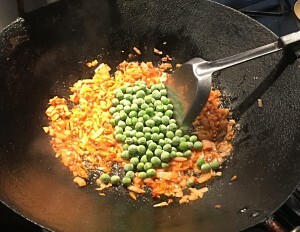 Heat the wok until it’s smoking hot and add a tablespoon of oil – we use peanut oil but any vegetable oil will be fine. 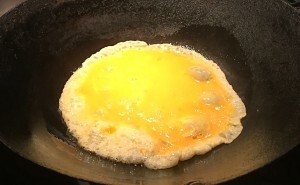 Lightly beat the eggs and pour in to the hot oil. Swirl the wok a little to ensure the egg is cooked; you may need to reduce the heat because you don’t want the omelette to burn. Once cooked, slide on to a plate and keep aside. 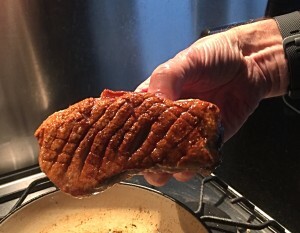 While the meat rests, you can complete the rest of the dish. 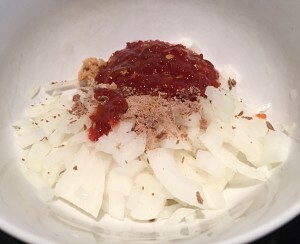 In a bowl, combine the garlic, brown onion, sugar, shrimp paste and sambal oelek. Stir it to mix the ingredients. By this point, the wok and rendered duck fat will be relatively cool. You don’t want to put this mixture into a hot wok, or you risk burning the garlic and making it bitter. Once it’s in, turn up the heat to full and start stir frying. You want the onion to turn translucent – effectively so that it softens. Next up, throw in your frozen peas. These need to cook for a few minutes so that the water they release evaporates. 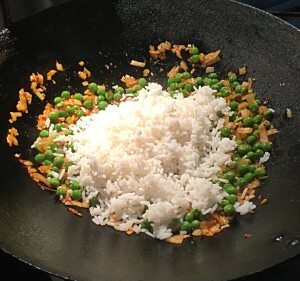 Make a small well in the middle and add your pre-cooked rice. And all you need to do is move the rice around to coat it and ensure it’s warmed through. When gluttonous husband did his Chinese cooking course with famed Melbourne-based instructor Elizabeth Chong, she taught him to press the rice flat into the base of the wok as a means of ensuring any clumps break up. Right at the end, add the omelette (that you’ve sliced up once it’s cooled) and the green spring onions. 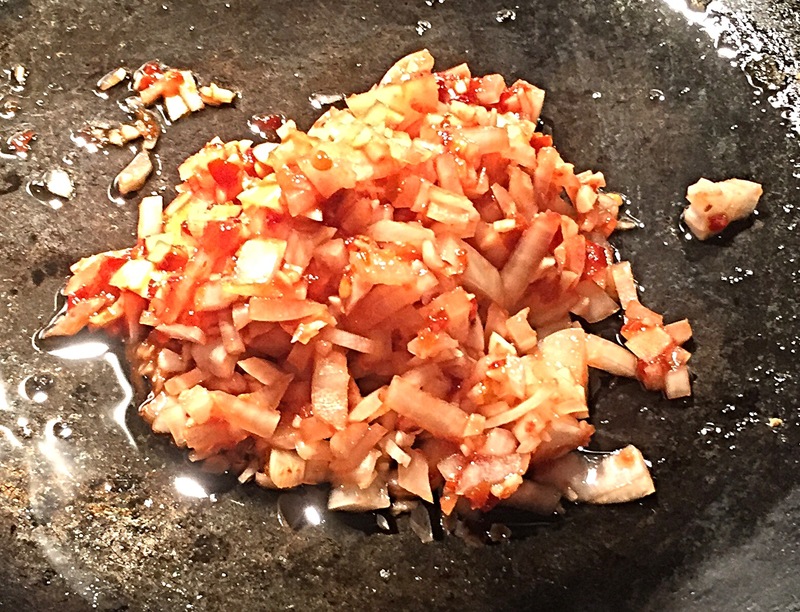 The heat is still on the wok at this point, but turn it off once you’ve stirred these ingredients through. It’s time now to slice up the duck breast. It’s easiest to cut it into slices and then strips. 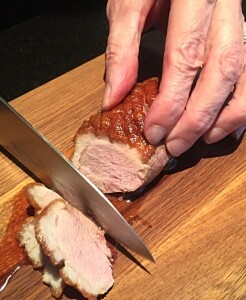 Add the duck to your rice mixture and stir to distribute evenly. You can also add a couple of drops of sesame oil at this point. Use it sparingly – it’s very potent. Sprinkle with the fried shallots for a bit of extra crunch (or you could use bean sprouts) and serve immediately. Enjoy!